When FSC Canada released the discussion draft of their National Risk Assessment early last month, we were eager to look at the details and begin considering the impact it may have on the business of certified wood products here in North America. 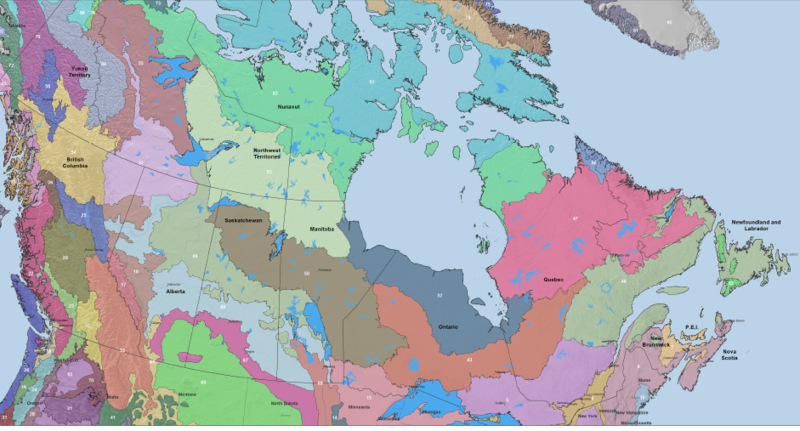 While the MixedWood blog is written from a clearly American point of view, we maintain a keen interest in our neighbors to the north. The release of FSC’s official Risk Assessments for North America (US and Canada) have long promised to have significant repercussions on the business of producing and sourcing certified wood products. And when we say “long promised” we also mean “long overdue” as they have been anticipated for several years and their delay has – and is – causing far too much disruption and confusion in the community. MixedWood subjected the US-NRA to a careful and detailed analysis and interpretation. We shared our ideas and perspectives here and encouraged our readers to do the same. It was our intention to repeat this process for the Canada-NRA. We are sorry to say that we failed. We did produce a summary of the proposed Control Measures – the part of the document that we consider the most significant and concerning – that you might find helpful. The level of detail and complexity in the rest of the document simply overwhelmed out ability to summarize and interpret into the limited space (and reader attention) that is practical for a channel like this one. Instead of tacking the entire Canada-NRA, we decided to focus closely on one region, hoping to illustrate some important points and perhaps inspire others to do the same in their part of the continent. In the extreme northeastern corner of the United States – part of the state of Maine – lies a beautiful river valley. The valley has been home to native peoples since the great glaciers retreated to the north many thousands of years ago. The first Europeans to settle here were French people, who began farming the narrow, fertile floodplains in the 17thcentury. 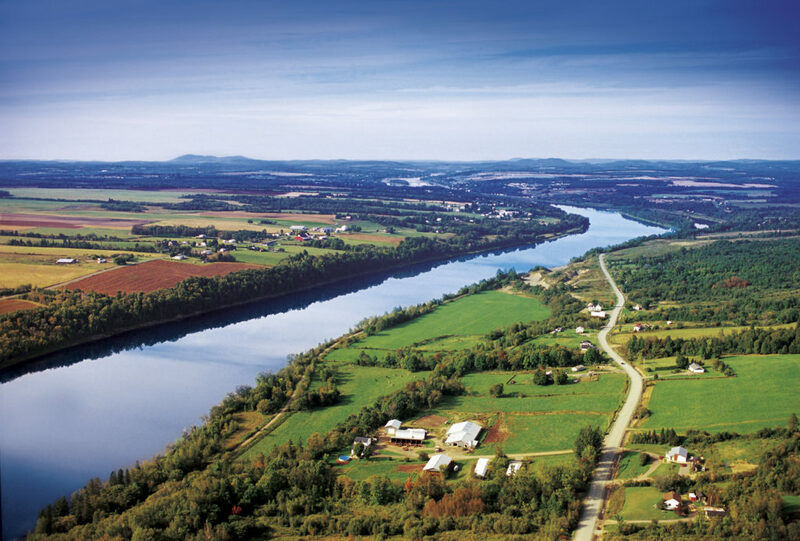 The pull and tug of politics, war, and economics left the Saint John Valley in the curious position of dividing 2 great nations, and now it forms a national boundary. The United States is on the southwest bank (left in our photo) and Canada is to the northeast (right in our photo). In spite of the dividing border, the people of the Saint John Valley are very much one community. Both sides speak a curious combination of English and French. Cultural, social, and economic interchange is constant and intertwined. Business and commerce is conducted freely on both sides of the valley, with little interruption. It is a very friendly place. While farming remains an important land use, the landscape is mostly forested. The leading industries are forest-product based and form a key part of the regional economy. The forests of the valley are also very much one forest. Ecologically, they lie right in the middle of the New England Acadian Forest ecoregion. The Acadian Forest is a remarkable, resilient, and highly diverse landscape that is dominated by spruces, pines, and northern hardwoods like birch and maple. Active, commercial forestry has been practiced here for over 200 years and the legacy of sustainable harvesting rivals anyplace in the world. Returning to FSC and its Controlled Wood program, we thought it would be helpful to examine what implementation of the new NRA’s – by FSC-US and FSC-Canada – would look like in practice. The following table summarizes the requirements that a wood products company, such as a sawmill, would be required to meet when purchasing logs in the Saint John Valley – beginning very soon. This is what a sawmill, buying logs in the Saint John valley, would need to do to satisfy the Controlled Wood requirements of the FSC. Both sides of the river (US & Canada). 2) Demonstrate access to information that verifies the geographic origin of logs. 3) Assess and document the risk of mixing in the supply chain. · Implemented actions to mitigate risk. 3) Demonstrate that log suppliers manage their land toward the appropriate amount of late-successional and older forest age classes. 4) Demonstrate that log suppliers manage their land to maintain key structural, compositional, and process attributes of old-growth forest types. 5) Demonstrate that log suppliers manage to support natural species composition based on ecosite characteristics. 6) Demonstrate that log supplier’s harvest methods are aligned with appropriate natural disturbance types for the region. Yes – we know that the left column is blank. FSC-US knows it, too. So does FSC-Canada. Now we all know. The message here is clear enough. The Saint John river doesn’t know which bank is Canadian and which is American. The spruce and maple trees that grow in the valley don’t know the difference either, nor do the Bicknell’s Thrush or the Vole’s Ears. If FSC-Canada implements its new NRA as proposed, however, you can bet that log buyers in the Saint John valley will quickly learn where to buy their logs. Do you agree? Disagree? Either way, FSC-Canada needs to hear from you. All the details can be found here, including how to provide comments. To date, participation has been very low which ensures that your voice WILL matter. Please do your part and tell them what you think.